AES is supposed to be about high-end gear for audio engineers, but apparently no one told the sparring rival computer guitar effects makers. In this corner, from Modena, Italy, the reigning champion: IK Multimedia AmpliTube. 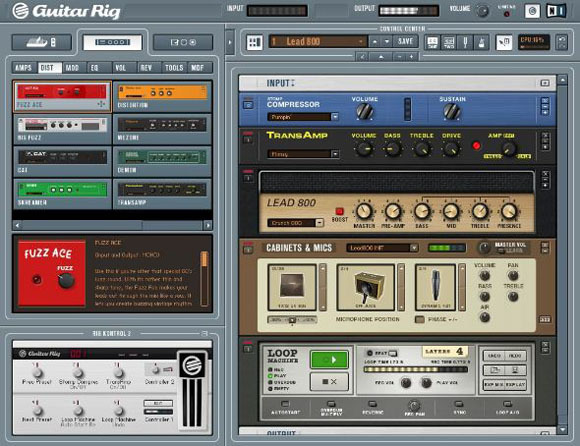 And in this corner, from Berlin, Germany, the challenger: Native Instruments Guitar Rig 2. Photos and comparison after the break. Both have the same idea: rather than just focus on software, they offer a hardware control surface / direct box accessory for controlling effects with foot switches and making plugging in the guitar easier. How do they stack up (on paper, anyway)? Audio I/O: Both act as a direct box (guitar in jack) and audio interface (balanced audio outs). Both have MIDI I/O (good for working with hardware effects or synths). NI adds two pedal ins and an extra guitar in; IK has S/PDIF digital I/O. Advantage: Tie. Control: IK has slightly more controls, with an extra LCD screen, 10 foot switches, and knobs (though you’ll have to bend over to use the knobs). NI’s design is ultra-simplified with just 6 foot switches, but they add an expression pedal, and since you’re already fiddling on-screen in software, their design makes more sense to me. Advantage: Close, but I’ll give this to NI. 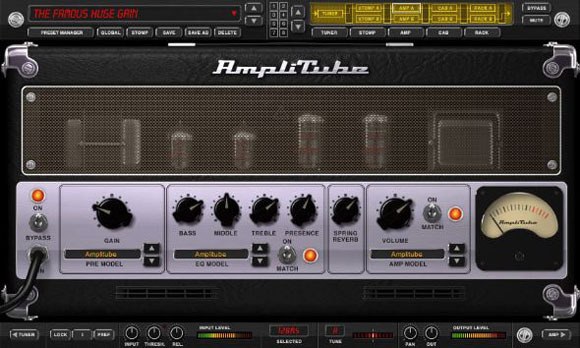 Included effects and amp simulations: Both these products have a zillion effects, amp models, mic models, and a zillion more ways of combining them. NI earns extra kudos for including a nice selection of bass amps, but let’s face it — both of these are just plain freakin’ huge. I’ve heard both, they both sound great, and plenty of players are going this way onstage. Advantage: Tie. Killer feature: Native Instruments wins this category for the inclusion of looped recording a la the Boss LoopStation. It’s the first software (guitar or otherwise) to really get this right, down to the ability to set loop length with a foot pedal. Advantage: NI. Hardware aesthetics: IK gives us Barney purple and black colors and giant 80s-retro lettering. NI opts for understated silver. Advantage: NI. Inclusion of a Swedish Model and Bad Pun: Super modeling? Get it? Like analog modeling? Groan. IK wins this dubious award, though no one at AES was demoing in a bikini. Advantage: IK. It’s too soon to declare an overall winner; neither product is shipping yet. But my early money is on NI, because of their simpler but prettier hardware interface and inclusion of looping. That said, I doubt you’ll go wrong with either one, so make sure you demo each before choosing. Speaking of availability, look for the NI kit in November. IK promises AmpliTube by the end of the year and StompIO “soon.” (Maybe there’s time to change the color?) Street pricing should be around $300-$500; looks like NI is including their controller whereas IK’s will cost extra. More on that once I can find details. 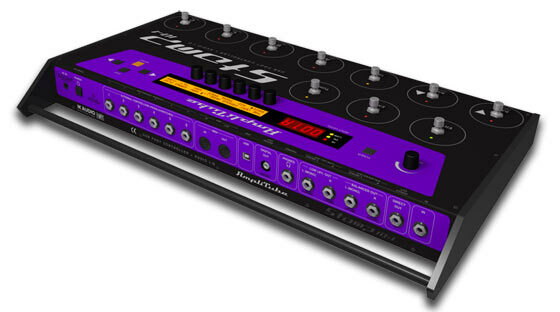 One more choice: There’s a third rival for your digital guitar stompbox: Line 6, known for their cheap-but-great guitar hardware, have gone software with the TonePort. Big scoop on the Line6: low latency, from what I’ve heard from a couple of users. (Latency is a measure of the delay between when you play a note and when it’s played back through computer effects; if it’s small enough, you won’t notice it at all.) NI and IK might beg to differ on that, though, so your mileage may vary.